Background & Objective: Over the last two decades, Alzheimer disease (AD) associated research has accomplished an overwhelming momentum, as it is one of the major current healthcare issues in the developed world. AD is characterized by the presence of Aβ mediated extracellular amyloid fibrils and tau-mediated intracellular neurofibrillar tangles and reports have highlighted their subsequent effects on neuronal synaptic activity, antioxidant response and recently explored mitochondrial dysfunction. Additionally, recent reports have demonstrated the mitochondrial dysfunction and associated physiological as well as cellular alterations triggered by fibrillar structures inside the brain tissue. Accumulated evidence indicated that mitochondrial dysfunction also plays a detrimental role in AD pathogenesis and reduction in mitochondrial dysfunction may provide an additional beneficial effect in AD patients. Currently available drugs are ineffective in disease progression and more symptomatic while mechanism oriented drug explorations have been intensively investigated. Therefore, search for effective therapeutic approaches in Alzheimer disease has directed the ongoing research more towards specific biomarker selection, physicochemical properties of drugs and its subsequent interaction with target molecules. 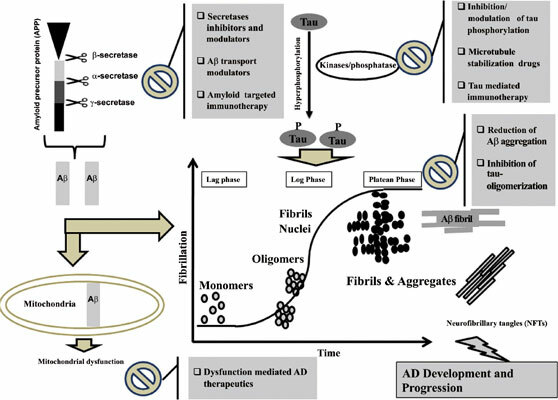 Conclusion: In present review, we have comprised an overview of the therapeutic advancement in Alzheimer disease with a prevalent hypothesis and current ongoing putative therapeutic approaches to provide recent insights in AD pathogenesis. Alzheimer`s disease, Amyloid precursor protein intracellular domain, amyloidogenic precursor protein, glycogen synthase kinase 3-beta, N-methyl-D-aspartate receptor, dementia.